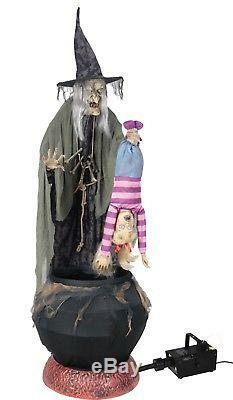 Stew Brew Witch Halloween Prop. This menacing enchantress stands before her bubbling black cauldron with flickering "smoldering coals" while holding a small blond-haired toddler by the feet. Includes 400W Fog Machine and hose attachment for added spooky ambiance! Once activated, the fog will begin to swirl in her green bubbling cauldron as the witch's eyes light up, head and torso turn from side-to-side and the child screams and flails about! The Witch Prop will say one of three sayings with each activation! Activation options: steady-on, Step-Here pad, and infra-red sensor (works up to 6.5 feet away and works in all lighting conditions). Includes a standard UL power adapter which plugs into any 110 outlet. Assembly required, easy to follow instructions are included. Assembled dimensions are 80"H x 40"W x 45D. Animation right to left uses 36 inches of space. Prop will say one of three sayings with each activation: "(evil laughter)"; See what happens when you wander into the woods alone. Let this be a lesson to you - and a meal for me! "; " You will make a tasty meal. Do you have any brothers or sisters that would like to visit me as well? Your satisfaction is very important to us. We will work out an arrangement to your satisfaction. We understand completely, and we will make it as easy as possible. The item "LIFE SIZE ANIMATED STEW BREW WITCH WITH KID Halloween Prop INCLUDES FOGGER" is in sale since Tuesday, November 13, 2018. This item is in the category "Collectibles\Holiday & Seasonal\Halloween\Current (1991-Now)\Props". The seller is "ukats" and is located in Flatwoods, Kentucky.